Are you the proud owner of a Galaxy Note 8? Well, if your answer is yes then you are in luck since the much-awaited Android 8.0 Oreo update has started rolling to Note 8 devices out of the blue. We’re aware that Samsung has been testing its Android 8.0 Oreo beta builds (along with the new Samsung Experience 9.0) on Galaxy S8 and S8 Plus devices for the past month. The Korean giant is expected to release the final bug-free Android Oreo update for these devices, once the beta test program ends on January 15. But, the Android Oreo update for the Galaxy Note 8 is a surprise because it arrived earlier than any one expected, even though there was a leaked build a few months ago. It, however, seems like Samsung has started rolling out the official Android 8.0 Oreo update. As seen in the screenshots attached above, the Android Oreo update received for the Note 8 carries the firmware version N950FXXU2CRA1.DM. 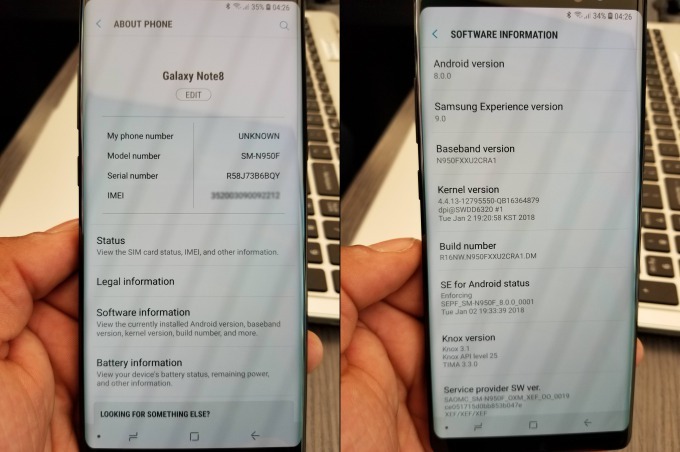 It is debatable if the said version is for an internal test build or an official one, but the Redditor also added that the update was received on the Exynos variant of the device. They added that the Android Oreo update has landed on a retail Galaxy Note 8 device, not one used for testing. This is surely an unusual development as Samsung is not one to soak test its internal builds on random devices. With no official word yet, it’s likely that update is being rolled out slowly. Got Oreo on your Note 8 yet? If not, which of these features are you most looking forward to? Drop your comments below and let us know.